One way they accomplish this: Chop down forests to create new sources of “legal” revenue, like cattle ranching and palm oil fields. Across remote regions of Honduras, Guatemala, and Nicaragua, traffickers are buying land, slashing forests, and turning them into lucrative agribusinesses, according to a recent study published by Sesnie and other colleagues in the journal Environmental Research Letters. These changes in land use are endangering key ecosystems, causing enormous economic losses to local dwellers, and jeopardizing the lives and cultural values of indigenous communities. Up to 30% of deforestation in those countries – and up to 60% of forest loss in protected areas– can be traced back to cocaine trafficking. The study found that cocaine slashed around one million hectares of forest cover in Nicaragua, Honduras, and Guatemala alone between 2004 and 2014—an area roughly two times the size of Delaware. Anomalous forest loss patterns identified here are distinct from land settlement, subsistence-level, and agricultural expansion-style forest loss than have been previously observed for Central America...While other land change factors can also be clearly identified as drivers of anomalous forest loss, such as southern pine beetle and timber concessions, we found that concentrations of forest loss likely related to drug trafficking are within many of the most culturally and biologically diverse and isolated regions of Central America. Consequently, drug trafficking is likely to operate synergistically with other drivers of land change that hasten forest loss, particularly within remote frontiers where illegal land grabs and consolidation are unimpeded by weak governance structures. How did the researchers reach this conclusion? Based on previous reports, Sesnie and an international team of experts theorized that these well capitalized investments would have a much a larger footprint on the forest than someone cutting down one or two trees for firewood. Simply put, it would look wildly different on a map. “With that premise, we said: ‘Let’s see if we can detect where those areas are and if they overlap with known centers for drug trafficking,” said Sesnie. The team built a 15-variable strong model to spot the distinct marks of narco-driven deforestation with data taken from the University of Maryland’s Global Forest Change website. They noted that forest loss was starker in remote areas with limited access and a lack of roads and public services. After considering possible explanations – like known illegal mining or timber concessions – large patches in Honduras, Guatemala and Nicaragua remained unaccounted for, precisely in areas where counter-narcotics data reported sightings of planes or boats carrying cocaine directly from South America. In these regions, the rate of deforestation matched the frequency of transgressions occurring: The more drugs, the more felled trees. Mapped (a) anomalous forest loss patch density (patches/km2) within moist tropical areas (green hatched area), (b) road density (roads/km2) for department s (grey lines) and (c) human population density (humans/km2) in Central America. Patch density estimates considers all forest loss patches classed as anomalous for Guatemala, Honduras, Nicaragua, and Panamá. These areas are more affected than others because of their strategic importance in trafficking routes (the money is spent where the money lands) and because they have looser land regulations and governance than other more central locations. The team also discovered that these patches were cleared with unprecedented voracity, a trait that didn’t fit with whatever subsistence use of the forests existed in those regions. And cocaine is a financial source that would allow someone to purchase many of those things beyond the reach of locals. When shipments leave the vast coca fields in South America, a kilogram can be bought for over $2,000. As the drug travels northwards, each package increases in value until reaching over $20,000 in many cities in the U.S. Although for years cocaine consumption had been slowly falling in the U.S., recent reports by the State Department suggest it might be experiencing a revival. One in every 20 Americans ages 18 to 25 used the drug in 2015, and the number of overdose deaths within the United States involving cocaine in 2015 was the highest since 2007. “The increased flow of cocaine threatens to increase pressure on law enforcement in neighboring transit states, particularly in Central America and Mexico, where most of the cocaine transits before entering the United States,” noted the State Department in their yearly report on global narcotics trade. Roughly 86% of the cocaine trafficked globally and 90% of the cocaine trafficked to the United States moves through the Central American/Mexico corridor, creating an estimated $6 billion in the region every year. It is a Midas-like transformation that spills bloody dollars along the way. But it’s a fairly recent one, at least in Central America. Before 2004, most of the drugs took the so-called Caribbean route through the Antilles, hopping from one island to another and using mostly naval transport. But after that year, U.S. drug interdictions in the Caribbean diverted the drug flow through the isthmus, particularly in regions with little or no government oversight. Although local authorities and U.S. agencies conduct regular patrolling and have managed to seize drugs and money, the international networks that operate from Colombia to North American have so far outsmarted and out-resourced them. These findings can be traced back to 2011, when Kendra McSweeney, a scientist with the Ohio State University in Columbus, travelled to the Caribbean coast of Honduras, a region she traversed in the 90s on research projects. At La Mosquitia, she discovered huge clearings where healthy woods used to stand. There were other indications of drug trafficking taking place in the area. The scientist recalled being approached by people who wanted to change $20 bills in places where cash is very scarce and dollars are not the normal currency. Troubled by what she saw and heard, she assembled an international team of experts and began looking for answers. A first wave of results focused on the Honduran Caribbean coast were published in 2014. Her findings opened a new chapter in the study of drugs and biodiversity. Up until then, there were reports of forests being cleared in South America to plant cocaine, but this was the first time a link was established between trafficking, laundering, and deforestation. But this wasn’t an issue “discovered” by American scientists. Indigenous communities and local leaders on the ground had been noticing – and dealing with – the influx of drug money a long time before McSweeney’s trip to Honduras. Central American study area and 2012 forest cover within focal countries. After her study was published, the plight of Central America’s forests and communities took center stage at drug policy discussion and many wondered how could it be addressed. One answer has stood out amongst the rest: empower those already living in the area. Take 43-year-old Candido Menzua, leader of the Embera-Wounaan. In 2014, I was sitting across him in a hotel lounge in Costa Rica, hearing how the 430,000 hectares controlled by his people were routinely infiltrated by traffickers. 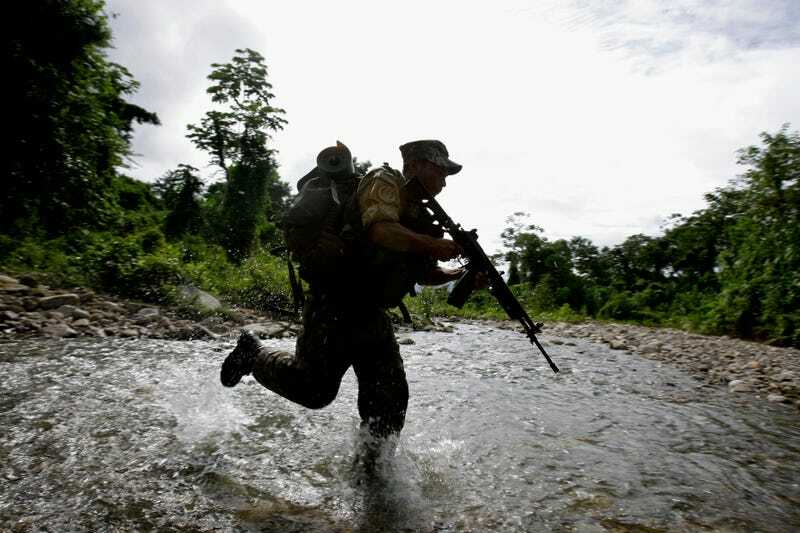 After hearing strangers were asking a youngster to carry “rice” bags through the territory at night, he doubled the patrolling in this forested region in Eastern Panama. “Really, who transports rice at night?” Menzua told me at the time. Their case fits a pattern from Mexico to Panama. Forest and indigenous communities – like the 10,000 strong Embera-Wounaan– are among the best defenses against cartels: they know the jungle, are well organized, and have a deep connection with the land. A 2013 report event suggests that deforestation has slowed or stopped entirely in areas where indigenous land-use are respected by national and local authorities.